US 6735444 & US 20120218103 A1 required additional hardware at both transmitter and receiver. 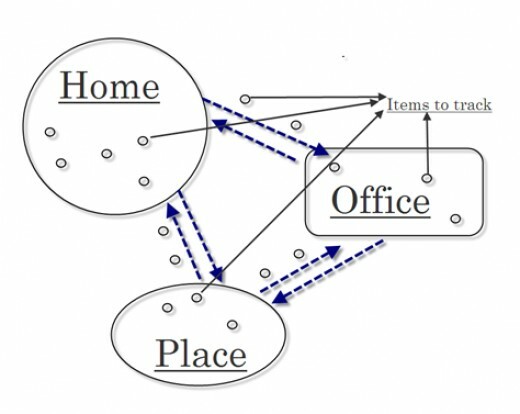 It also has capability to locate the misplaced items with distance calculation. Weight & height of the tracker device play important role while carrying such items while roaming. Portability of the device is very much important in such condition. If it is not portable enough then it is always difficult to carry. In today era mobile is the best portable device which is very much easy to carry. 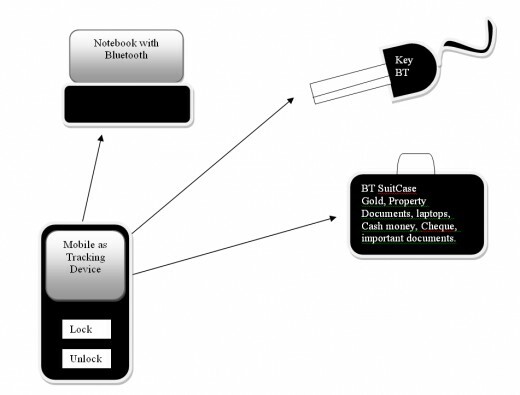 This purposed method can be considered as low cost solution as alert mechanism for misplaced valuables using mobile. The present disclosure will help user to get an alert of their valuables if it got misplaced or went out of range. 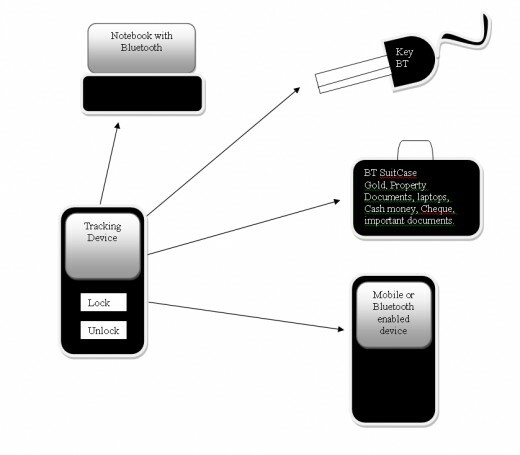 The present discloser provides Method and device for alerting misplaced items. 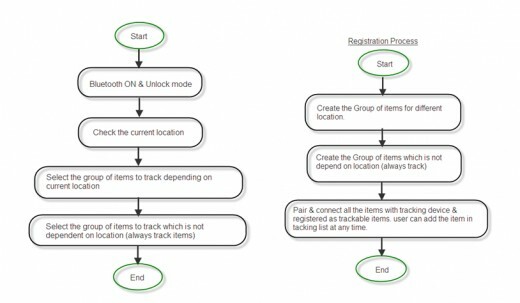 Whenever a device or item which we want to keep track is moved out of the range then the present method and device will create an alert to the mobile device. We need to add Bluetooth to the valuables or device for which we want alert message. We need to register the valuable. Once it is registered it will be added to Registered Valuables List. In default condition mobile will be in unlock condition, mean it will not generate any alert for valuables. To Activate the Alert we need to go to lock mode, by pressing lock key. It will search for available Bluetooth device. Device will compare the list of available Bluetooth device and Registered Bluetooth device. In normal condition we will not get any device which is registered but not available. In normal condition number of available Bluetooth device will be always greater than equal to number for registered Bluetooth device. If we forgot or misplaced our valuables then we will get the device which is registered but not available. Now tracker device will generate an Alert Message with sound and vibrate. Using ref. patent US EP1256211 A2, it can be possible to set the threshold of distance to get notification of your device based on RSSI value (receiving signal strength indicator). While not in use it can be disabled / unlock to save battery. This device can be attached to any device and can be changed from one device to other device as required. Once removed from device user will get notification. 1.1 Detailed description of structure and function of the invention together with alternative embodiments/examples. 1) Travelling in a Train/Bus/Flight or suspicious location. We need to monitor our valuables continuously. With the help of this device we can get alert so came to know about valuables status automatically with out monitor it manually. While sleeping in night also it will help us to track. 2) Shopping Mall/ Store/Shop as Low cost solution for Asset Alert System. 3) In house Notification for valuables. to server for reference location of the device. Group name or tag name can be applied to the different items for particular location. For example in a house you want to track your jewelry box, mobile, Personal certificate folders, electronic equipment. And while roaming you want to track keys, wallet, Identity Card, & bags. At office you want to track your Drawer or tool box Key. So in this condition you can group/tag the items as mentioned below. You can add or remove the items in Group searching list at any time if items are registered once. In general misplaced item we need to enter what we need to find and when we need to find. We need to manually trigger or enter the list while going outside. But we don’t have such time while going outside in a hurry. During those time changes to forget the items which we need to carry is most usual case. So using this process or method we can avoid such situation and we can make sure that we always carry our valuables or need items as and when we require it. 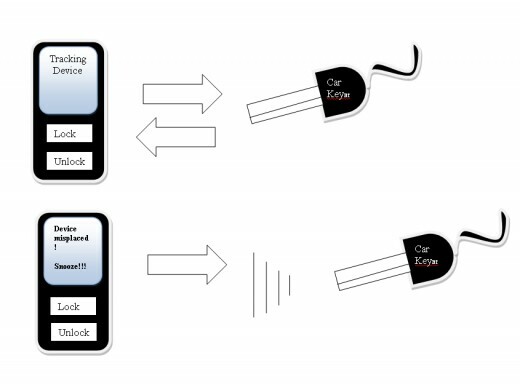 Generating an alarm at tracking device will give indication to thief about the device. 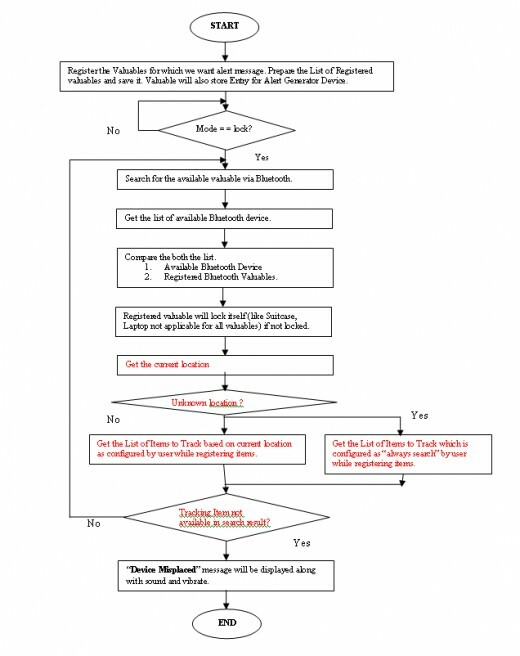 Alarm & display should be generated at tacking device only (like mobile at user end). Alarm should be generated only when host lost or misplaced the item. Message can displayed at user end to confirm the search success at user end as required by user. Excellent post! I must thank you for this informative read. I hope you will post again soon. Villas in Whitefield bangalore.